There is a spider which eats the sleeping people, scares the humans, takes camels stomach as favorite food etc. 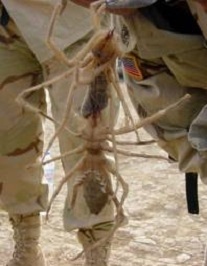 this spider is called as the camel spider and it lives in the desert area. It belongs to the spider’s family but it is really a different animal. As the scorpions are also from the same family, these spiders are also called as the wind scorpion. It had created a sensation in the internet in 2003, when the American soldiers in Iraq kept this photo in the net. They have shown it in a big size which is up to half of the human body with graphics. Its actual size is 6 inches. So everyone started knowing about it and the scientists came to know about different facts of this animal. Many people think that these animals come back of them but these animals like to be in darkness and so they go back of the people to be in shade. Generally they stay inside the holes which are dug in the sand in the daytime and during nights, they go out in search of food. They don’t have any poison in their body but they have sharp teeth and can fight with the scorpions. They eat small birds and animals with the teeth and they won’t harm the humans. They run up to 10 miles per hour which is equal to 16 kilometers. They have five small eyes like the scorpions. « How is the moon seen in blue color? | When does blue moon appear? » How is the camphor produced? | What are the uses of camphor?